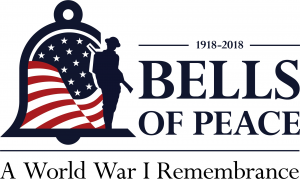 The World War One Centennial Commission has established “Bells of Peace: A World War One Remembrance” to encourage citizens and organizations across the nation to honor American men and women who served 100 years ago during World War I, especially the 116,516 who died. The war ended by an armistice agreement between the warring countries at 11:00 am on November 11, 1918. “I encourage Area 1 handbell musicians to participate and to spread the word about this program to your local houses of worship, schools, town halls, firehouses, police stations — anywhere people may gather on that day to honor and remember,” stated Carlene Ruesenburg, Chair of Area 1 Handbell Musicians of America. Those who wish to participate are asked to toll bells 21 times at 11:00 am local time on November 11. The World War One Centennial Commission has set up a page on its website – ww1cc.org/bells – where people can find information and tools to conduct the bell tolling, and to meaningfully commemorate the service of their local World War I veterans. The Bells of Peace web page includes links to poetry, music, sacred service options and more. Participants are encouraged to sign up online, and then follow up after November 11 with photos and videos of their service or ceremony. Posts will be added to the commission’s permanent archive. World War One took place between July 1914 and November 1918 and is among the deadliest conflicts in world history. The United States officially entered the war on April 6, 1917. Some 4.7 million Americans stepped forward to serve in uniform, of whom 2 million were deployed overseas to fight. Congress established the U.S. World War One Centennial Commission in 2013 to provide educational programs, public outreach and commemorative events regarding U.S. involvement in the war. The commission is authorized to create a new national memorial in Washington, D.C. to honor the men and women who served. Information on the new National World War I Memorial can be found at www.ww1cc.org/memorial.